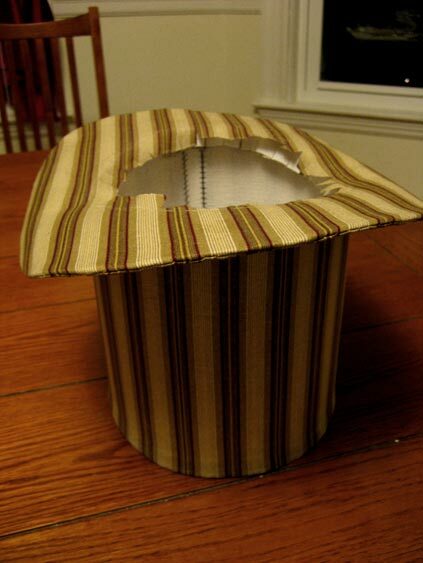 I've started making a top hat using traditional millinery methods. 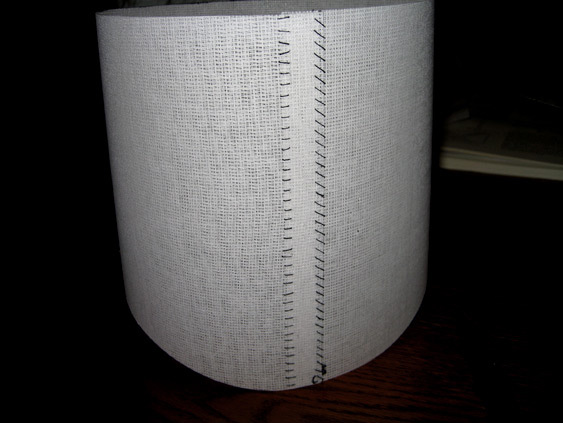 Here I'm tracing the pattern onto buckram. 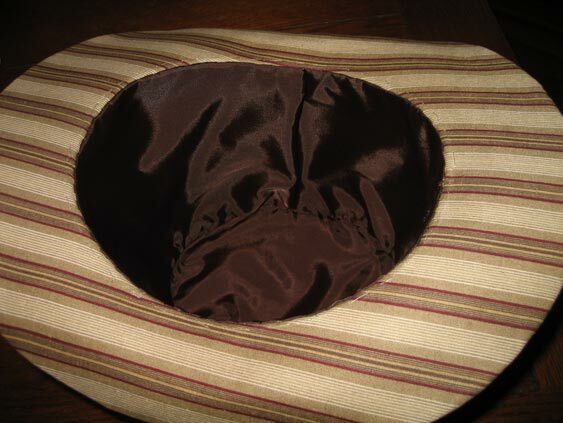 I've given the inside of the brim a 5/8" hem so it can attach to the crown. 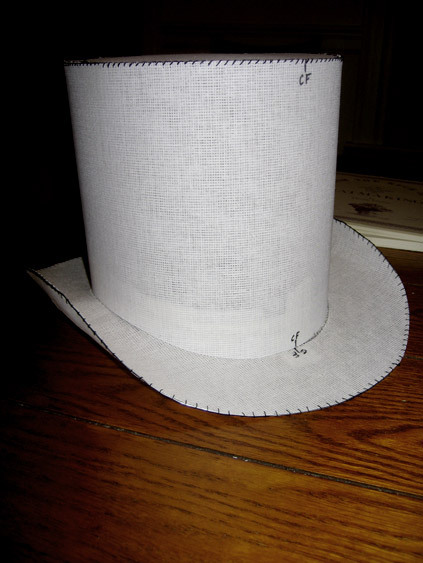 The buckram pattern, all cut out in three pieces: the sideband, the tip, and the brim. 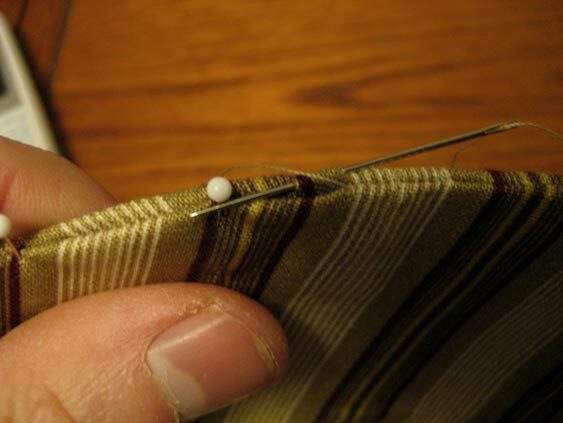 Stitching the sideband together where the hem overlaps. 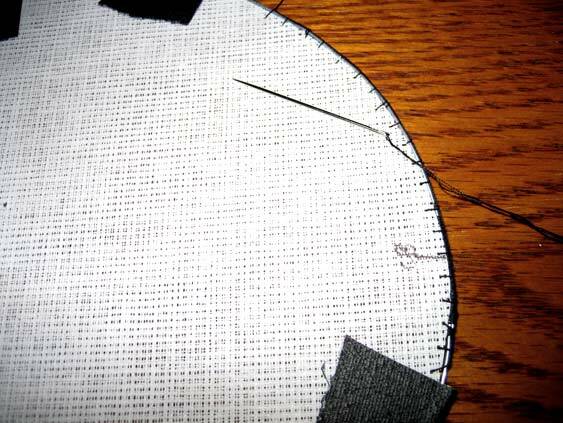 I'm using a whipstitch, and I'll do this twice, once on each edge of the overlap. All finished with the sideband. 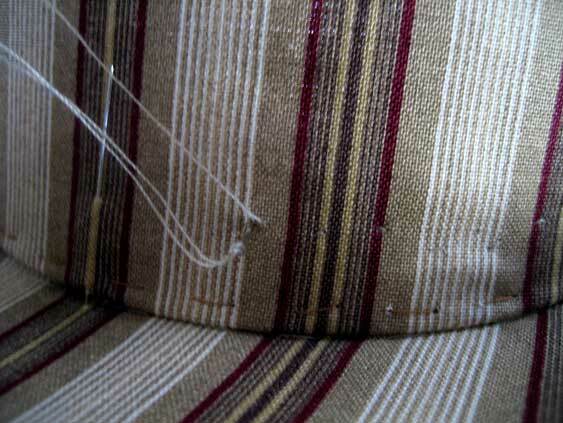 Beginning to stitch the wire onto the edge of the tip. The wire is held on with tape, but it's already been formed into the proper shape, and lashed at the ends to make a loop. Shiny! Can't wait to follow the progress. A promising project, and one I'll follow with interest. "It's amusing, it's amazing, and it's never twice the same: It's the salt of true adventure and the glamour of the game." 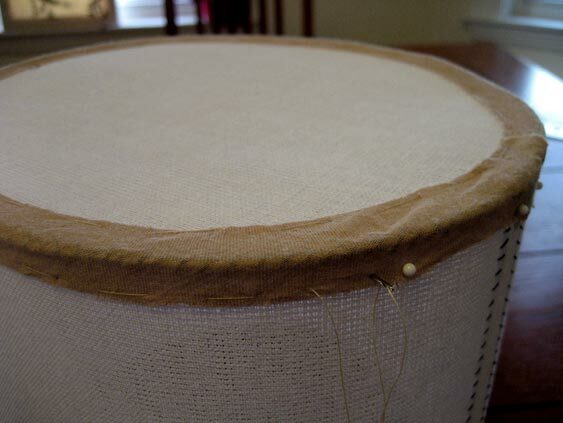 The completed tip, with the wire stitched to the outer edge. I actually had to redo this, because I forgot to account for the width of the wire in addition to the tip, and it wouldn't fit inside the sideband. 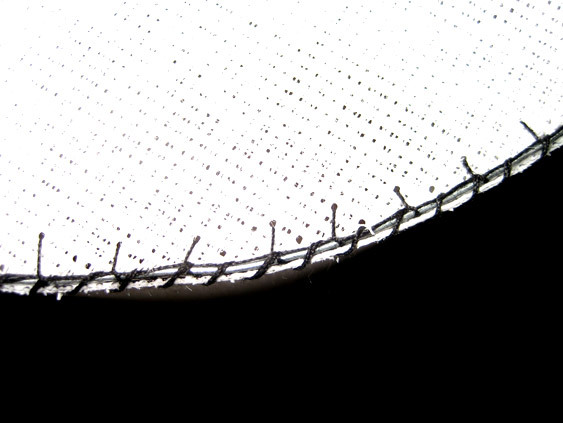 I took out all the stitching and trimmed about 1/16" all around the tip before stitching the wire back in place. Now it fits. Whip stitching the tip to the sideband. The tip (now) fits just inside the inner diameter of the sideband, and when it's sewn in place it will form a smooth right angle. The crown assembled. 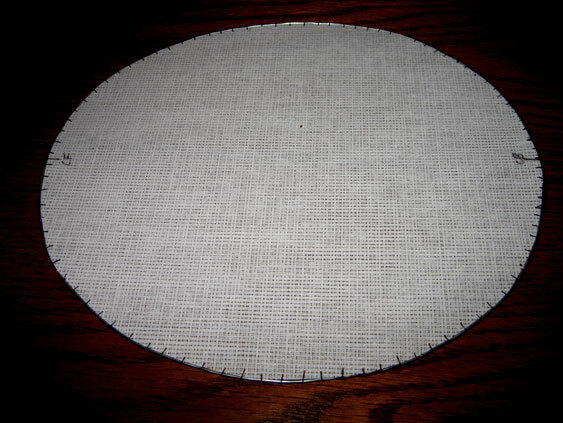 A note about the theatrical buckram I'm using — it's in two layers: the rougher, sized buckram, and crinoline, a soft finer-weave fabric. 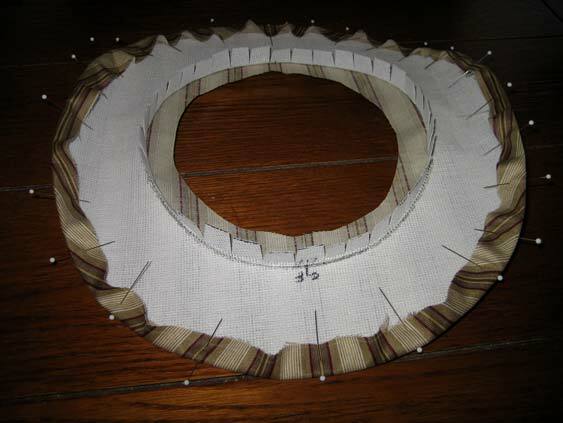 In the hat, all outer surfaces will the the crinoline side, with the buckram side to the inside. This will allow me to cover the hat with fabric smoothly. 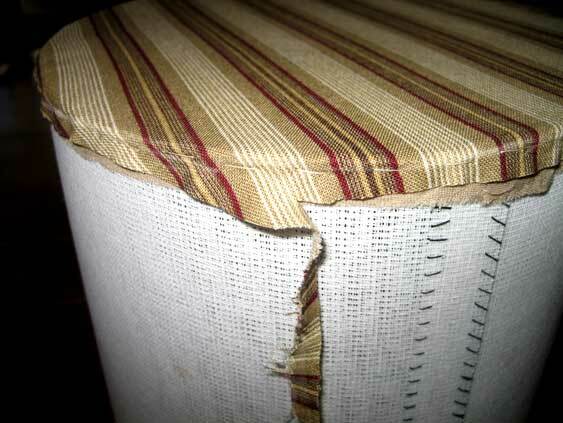 A closeup of the seam between the tip and the sideband. 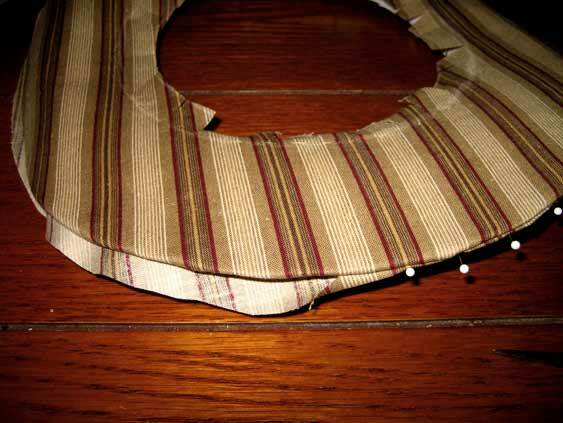 Note that the wire is neatly between the two pieces of buckram, creating a smooth line as well as support for the fabric. 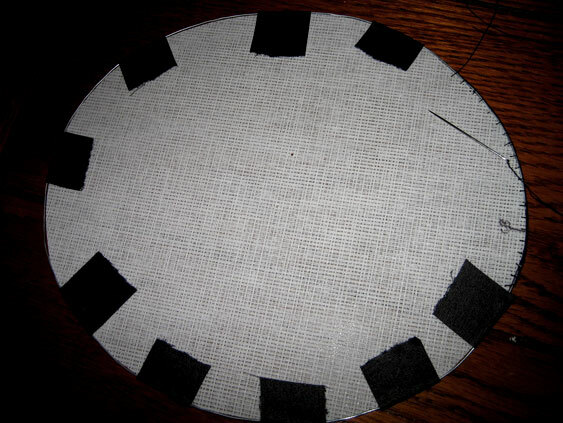 A side view of the crown to show the curved bottom, which will create the signature curve of the top hat's brim. This shot makes it look like it's tapered to be larger at the top, but that's just because the bottom isn't perfectly in shape. 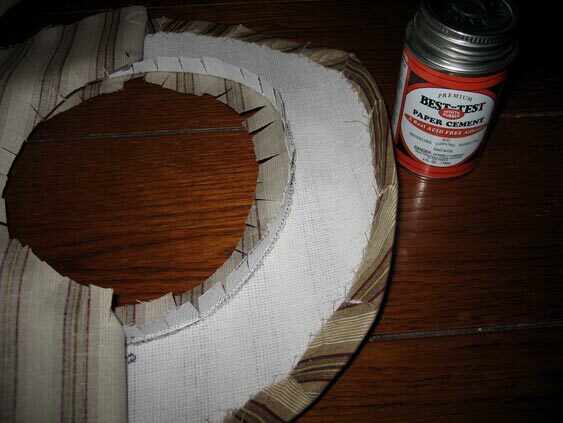 This will be a straight stovepipe hat. Beginning work on the brim. 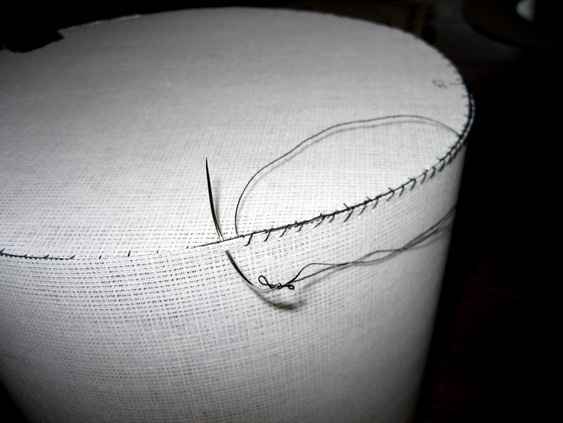 I'm sewing the wire onto the connection point between the brim and crown. 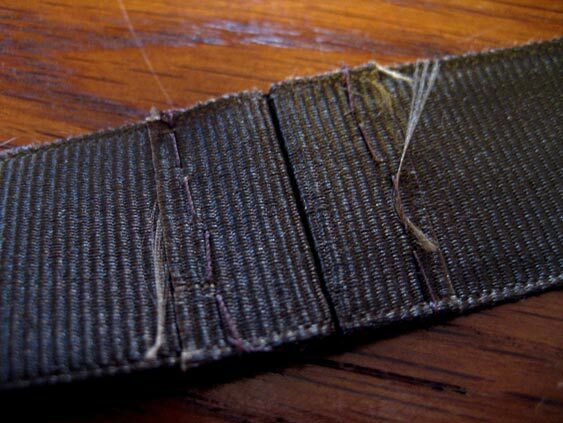 I didn't feel like changing to a black thread in my sewing machine, so it's harder to see, but it's just a zig-zag stitch to hold the (preshaped and pre-connected) wire in place. I'm working with this piece crinoline side down, so that when the brim is curled up on the sides, those will have the smooth face showing. 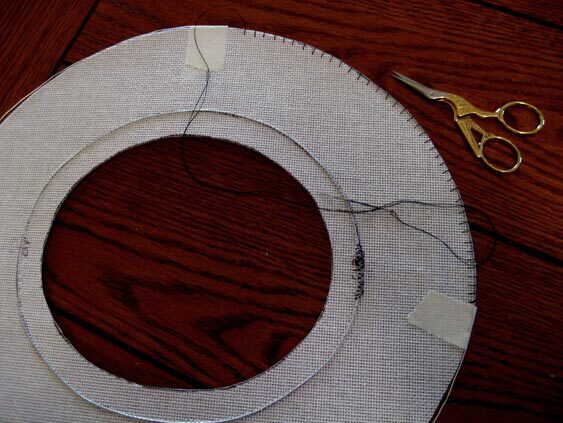 Stitching the wire onto the outer edge of the brim. Same deal as before. 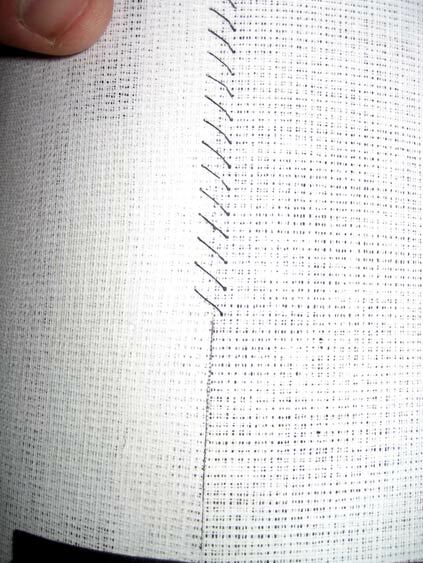 A closeup of the different sides of the buckram, so you can see the rough buckram vs. the smooth crinoline. I've clipped the inner seam allowance at the headband and folded the tabs up. This will be stitched to the crown once the frame is covered in fabric. 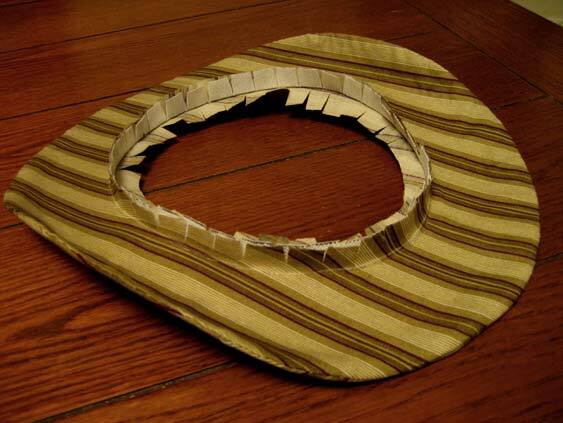 I've taped the crown to the brim so I can form the brim the way I want. The two pieces are not permanently attached, and won't be until the frame is covered. 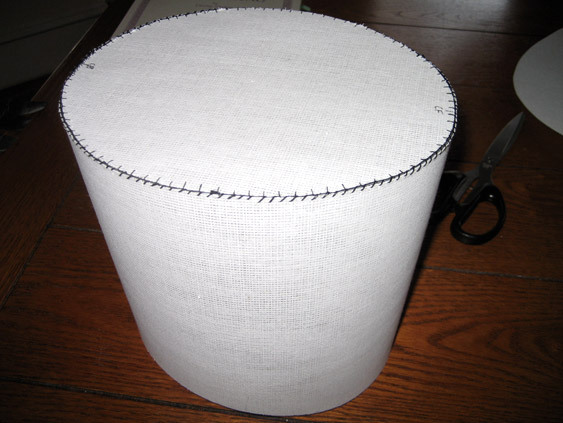 I formed the brim by holding it over the tea kettle's steam until the buckram softened, and then holding it in place until it went rigid again. The wire rim helps keep the shape, but it's a little tight now that I've rolled the brim up. Maybe I should have shaped the brim first, and then wired it. Ready to be covered in fabric. I need to go out and get that, so it'll be a few days before my next update. very nice! I look forward to seeing the final product. 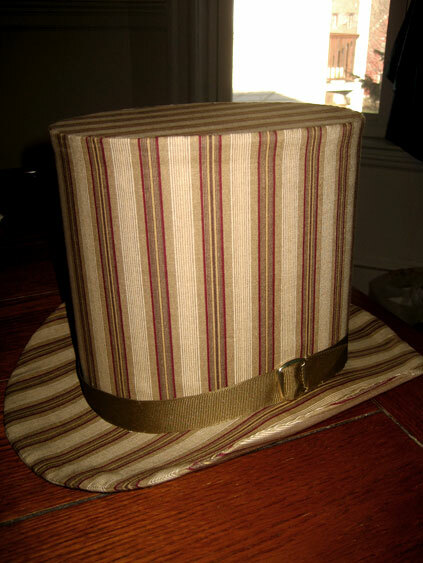 Where did you obtain the pattern for the top hat? I made it up. I figured out the size of the tip/crown opening from measuring my head, and worked from there. I have a big pad of newsprint from an art store that I use for hashing out all sorts of designs, from this to clothing to my gun holster. 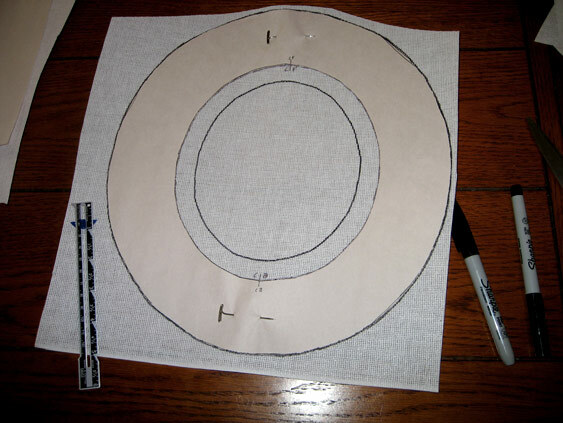 Once I had the pattern on paper I could transfer it to the buckram, and I'll use the paper pattern again for cutting out the fabric. It is looking great, I am watching this with interest, I look forward to seeing it covered. Are you an experienced hat maker? I am just curious because your work looks very confident and accurately rendered. Actually what I really want to know is could someone with no experience of hat making make a successful topper? I would love to make one for my dear intended as he has an unusually large noggin that is exacerbated by humomgous thick dreadlocks and no hat we have found will go anywhere near fitting. Also, where would a person find the materials used? you can buy the material on ebay easily enough- you can make a trial hat our of card first before you try making a proper one. This is the first hat I've ever made. 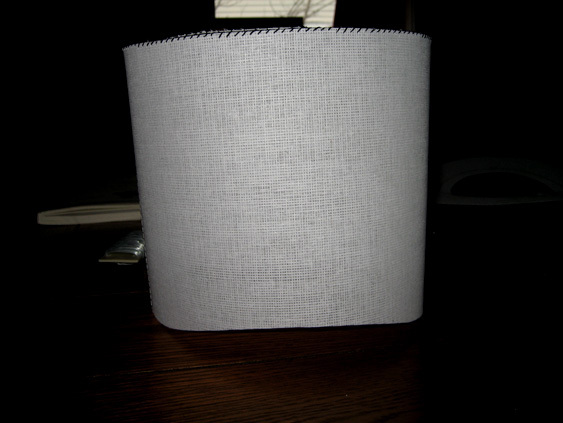 I purchased my buckram online, and got enough to make lots of hats! 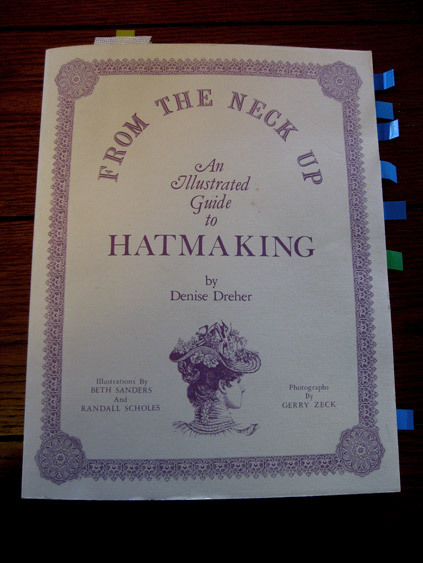 I'm using the book From the Neck Up: An Illustrated Guide to Hatmaking, by Denise Dreher, and it is extremely descriptive. This is a great walkthrough. When it's finished, I say it should be stickied. I'm tempted to have a go at this one myself! My concern is in the covering. I'll see how you do that before jumping in as I have questions about that bit! I seem to recall one of our other members did a tutorial about making leather top hats. The thing I notice abot your design is that It is very straight. cylindrical. 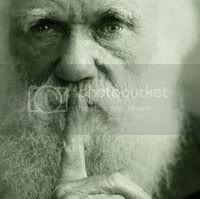 If memory serves many top hats (including the one in your photo avatar) have a narrowed center. I'll see if I can track the tutorial down in case it helps you out with any tips. Oh, I know. 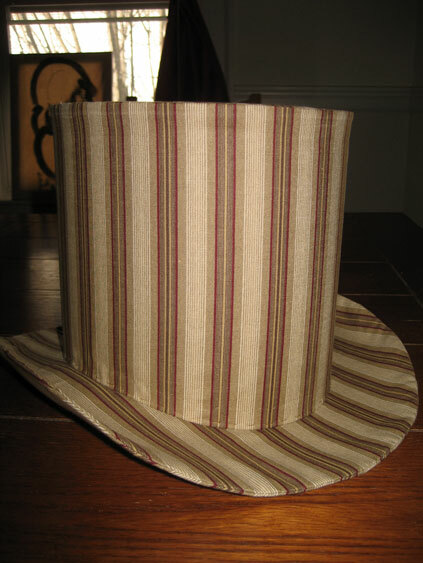 This is a stovepipe hat, which is straight-sided, like the kind you traditionally see Abraham Lincoln wearing. It's also more typically what was worn a little earlier, in the Regency period. Since this is my first hat I wanted to try it a little simpler before attempting the tapered crown. I'll do that one next, have no fears. Now with 400% more bureaucracy! A most fascinating endevour, pray tell, what material are you using to cover it? An excellent result, and all the more impressive as it's your first. I'm looking forward to seeing your progress. I haven't had a chance to get to the fabric store. 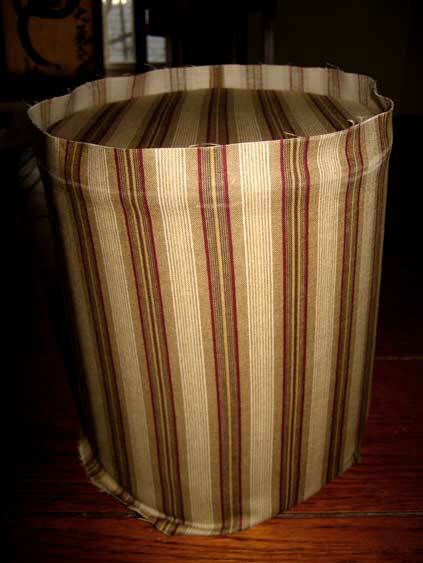 I'll have to see what they have, but I'd love to get a brown pinstripe if it's available. It's been a while since my last update. This is the second time that the forum's gone down when I'm ready to update, so maybe you can all blame it on me. Anyway, here I'm adding mulling around the wire of the crown. This does two things: first of all, it smooths the line of the wire and makes a nice rounded edge. Second, since I decided to use a lighter fabric it will hide the black stitching. I'd originally thought of using black fabric so the black thread wouldn't have mattered. In the future I'll just use white thread, although the black worked nicely for this project so you could see my stitching. Mulling on the outer edge of the brim. 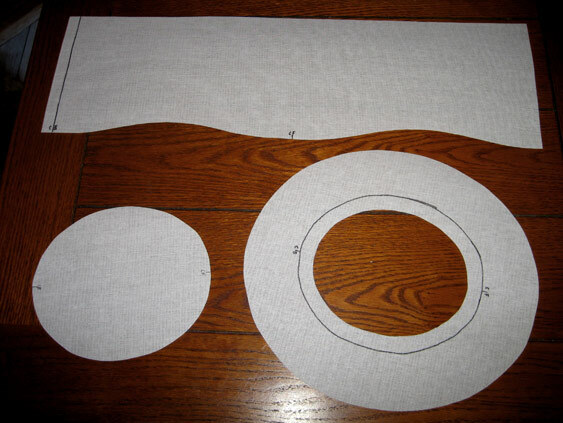 The mulling is just some spare fabric that I cut on the bias. 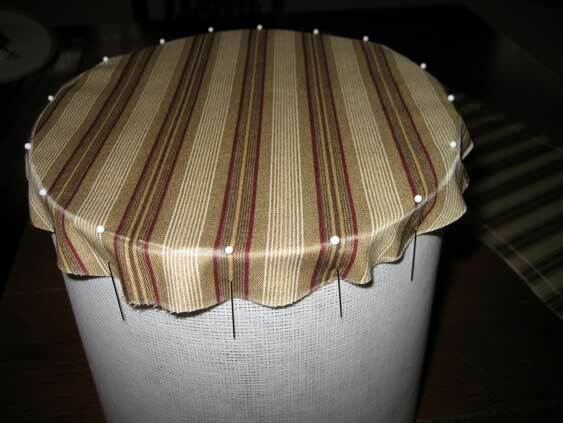 I kind of wish I'd made it wider, since it would have been easier to sew the brim fabric onto the mulling later, instead of through the stiff buckram. 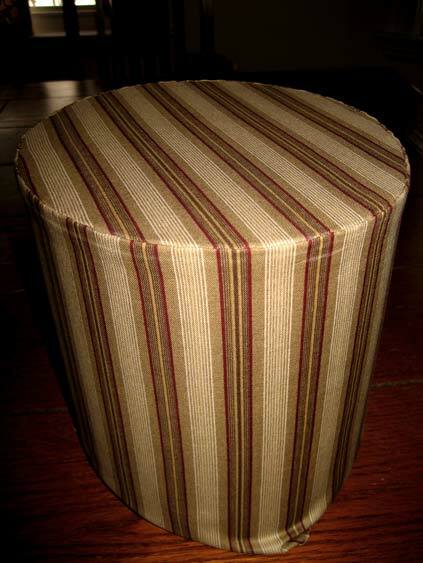 The fabric that I chose for the hat. This is the piece for the sideband, and at the bottom is the tip of the crown. I made sure to allow the pattern to line up at least in the center front. The tip pinned in place. The chalk outline is just from when I traced the pattern onto the fabric. 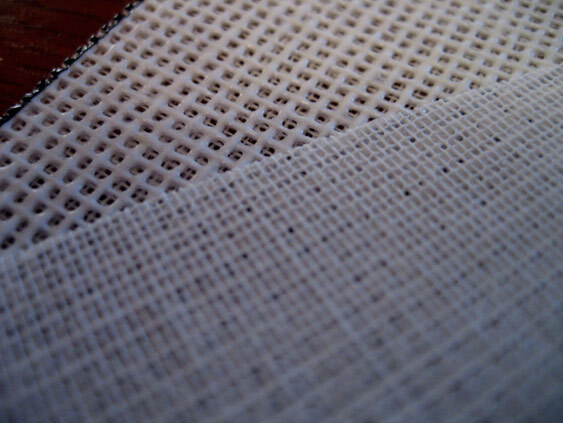 The fabric has been stretched as tightly as I can get it without distorting the wire or buckling the buckram frame. After stitching the tip in place I trimmed the excess material down to about a quarter inch. 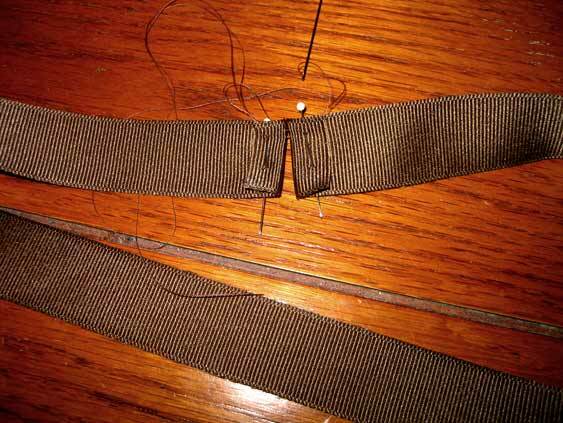 Fitting the sideband in place to measure where to sew the back seam. After pinning it in place here I removed it from the frame, turned it inside out, and sewed down the rear to make a tube. Here it is, sewn and in place on the frame again, ready for the next step. Normally, I would have cut this piece of fabric for the sideband on the bias so it would fit snugly, but since I wanted the stripes to be vertical instead of at a 45 degree angle, I just made it as tight as I could. 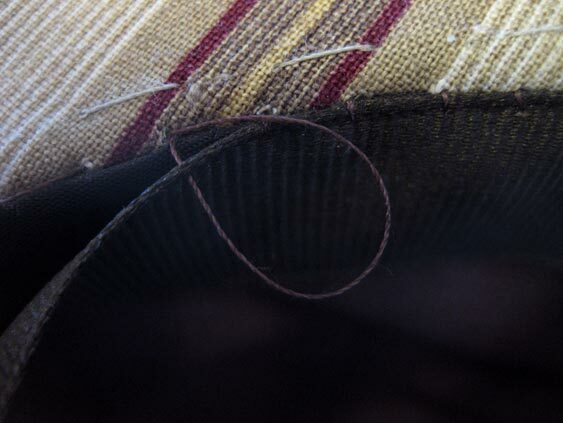 Slip stitching the sideband to the tip. Notice how the first three stripes line up in the center front. 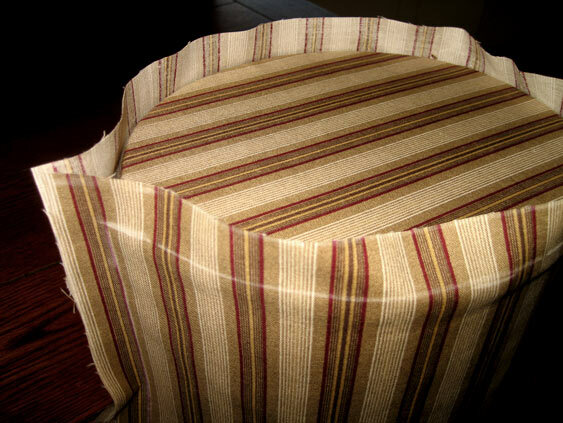 I've folded the excess fabric at the top back on itself so it's folded between the outer fabric and the frame. It seems like it would be kind of bulky, but it doesn't show when it's finished. Using rubber cement I folded and glued the excess fabric over into the inside of the frame. When it was dry I basted the fabric in place, just for extra security. 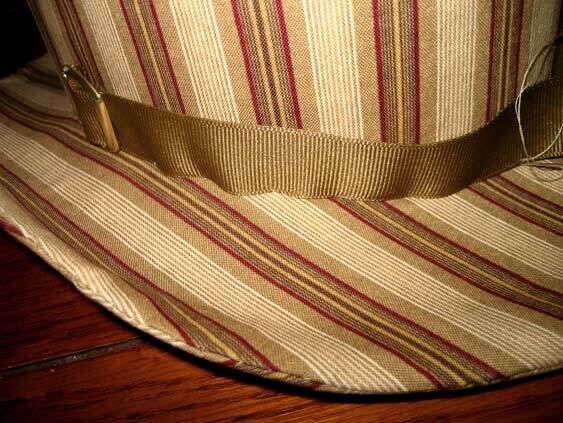 Since I'll have a hatband, I don't need to worry too much about these stitches showing. Now the crown is finished, and in my next installment I'll work on the brim. It's clear, step-by-step tutorials like this that give us younger members the confidence to try things ourselves, keep it up! Also, another vote for this being stickied! "This is a sticky situation, Baldrick. Stickier than when Sticky the stick insect got stuck on a sticky bun." Looking great, keep up the good work! 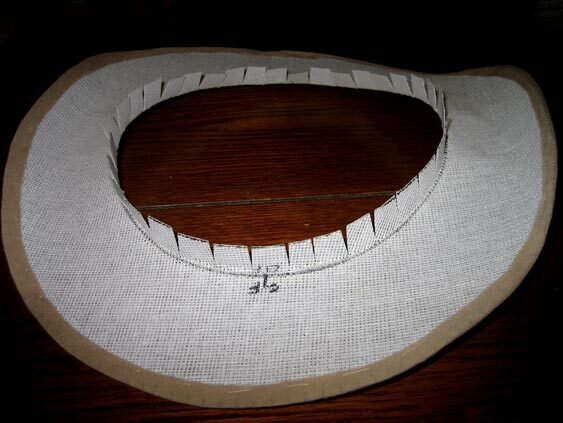 After cutting out the piece of fabric for the bottom of the brim (the bottom in this case is the "right side" which, because of the upturn on the sides, has the most showing) I basted around the chalk line, just outside the wire at the headsize opening. This will allow me to stretch it toward the edges and not distort the opening. Now I can stretch the fabric, pinning it in place. 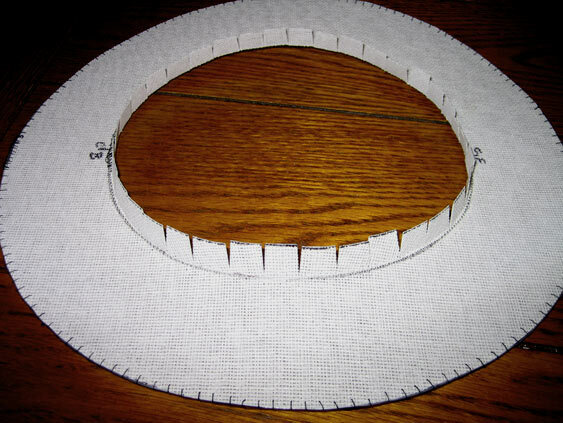 Because of the roundness of the brim I will have to clip some darts in the fabric to allow it to lie flat. 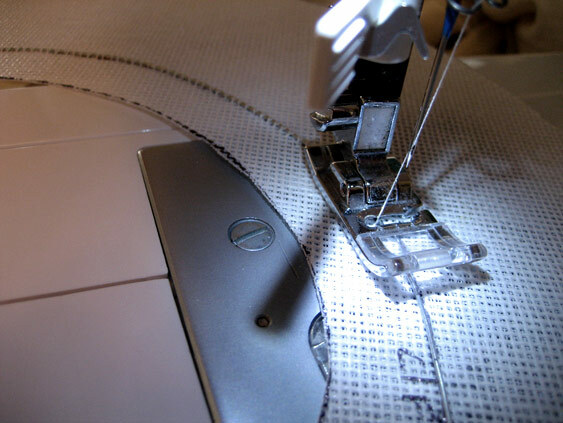 Sewing the fabric in place with a catch stitch. You can see the darts. I've cut them as close to the edge wire as I can without allowing them to show. For the top (the "wrong side") I need to glue the fabric to the portions of the frame which are concave, since otherwise it will pull off the frame when stretched. I need to clip the hem allowance at the headsize opening to allow it to fit over the already-clipped buckram frame. 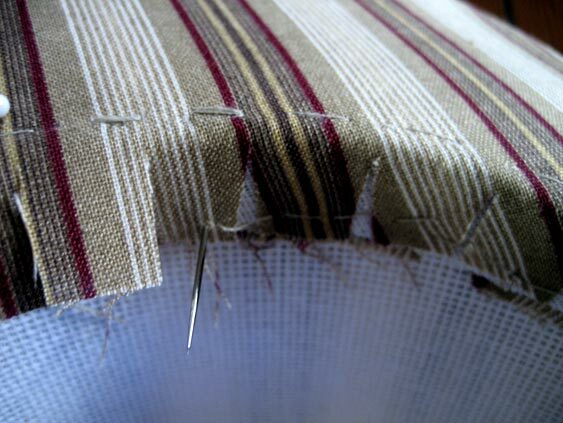 Turning the hem under and pinning the wrong side in place. 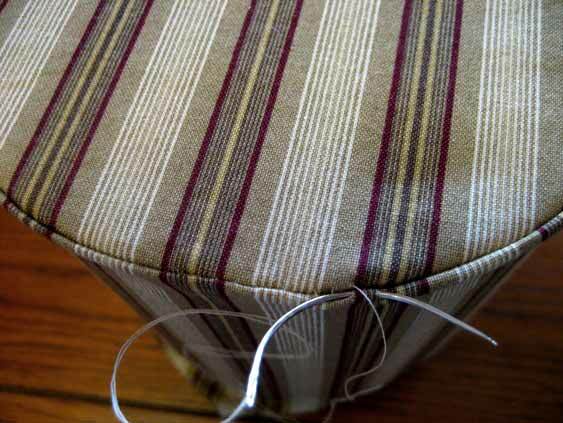 Slip stitching the wrong side to the right side. The completed brim. 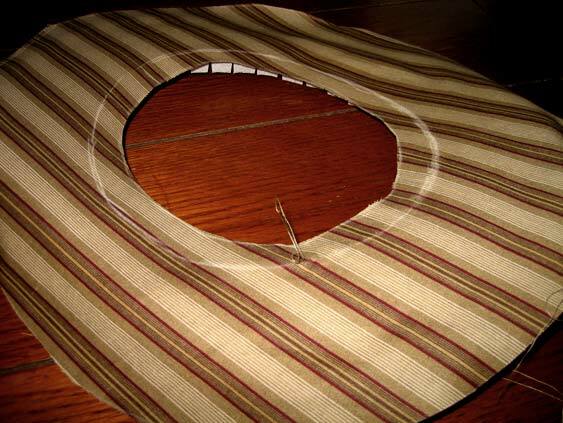 I could bind the outer edge with bias tape, but I'd like to leave the line the way it is. The brim sitting on top of the crown, ready to be attached. 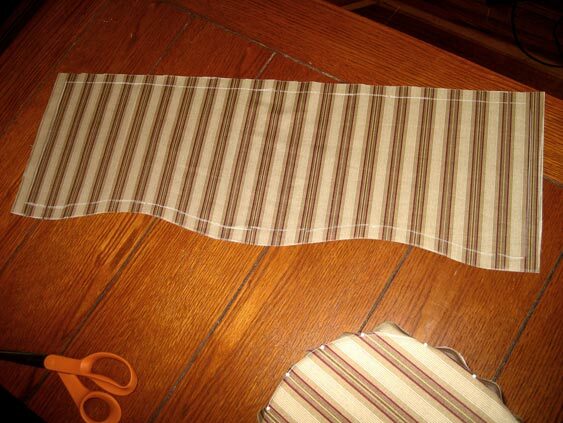 The center backs and center fronts are lined up, and the stripes in the fabric match. Stab stitching all the tabs of the brim together to the crown with uneven basting. 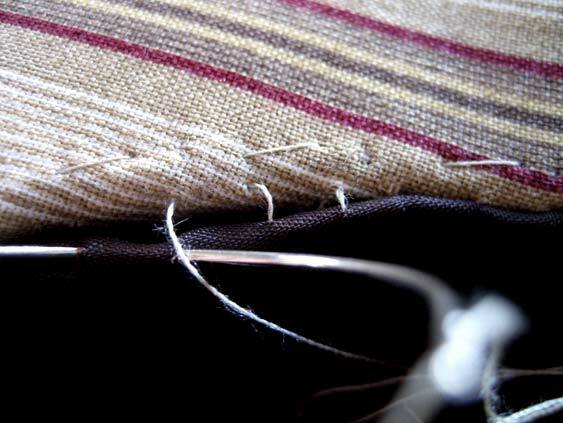 The larger stitches are on the inside, and the smaller on the outside. The smaller stitches on this side. It doesn't matter that the stitches show, since I'm adding a hatband later. Adding the hatband. After I took this photo I redid the stitching so it wasn't bunched up like it is here. 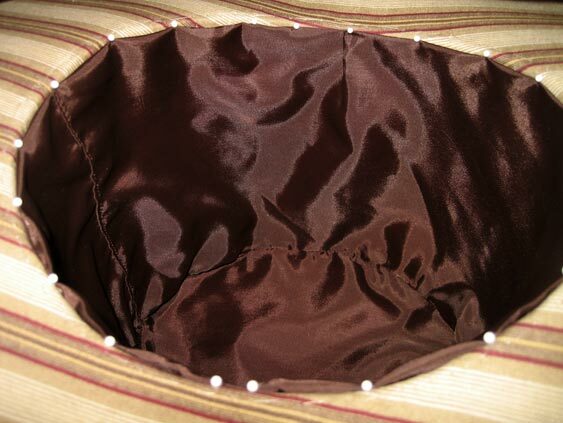 I can sew through to the inside of the hat, because I'm going to add a lining next. 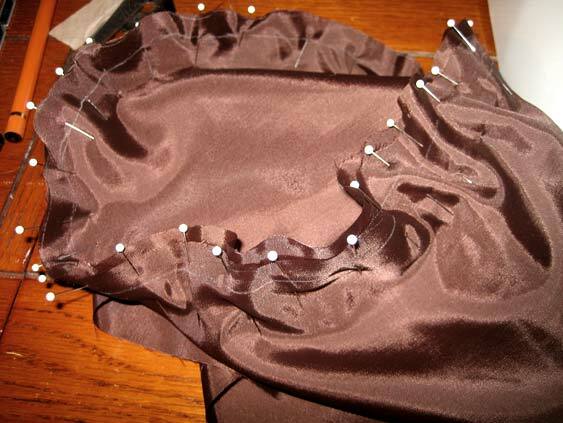 Pinning the lining together before I sew it. At last! Something I can sew on the sewing machine! Almost everything so far has been hand sewing, and it takes a long time. This is fabric that I rescued from the lining of a leather coat I've torn apart for leather. 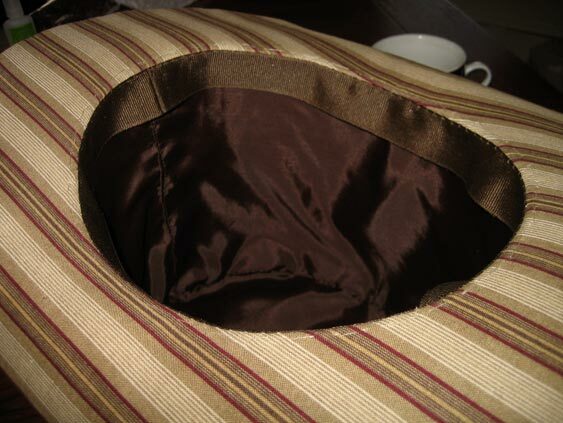 The lining pinned in place, the seam lined up with the center rear of the hat. 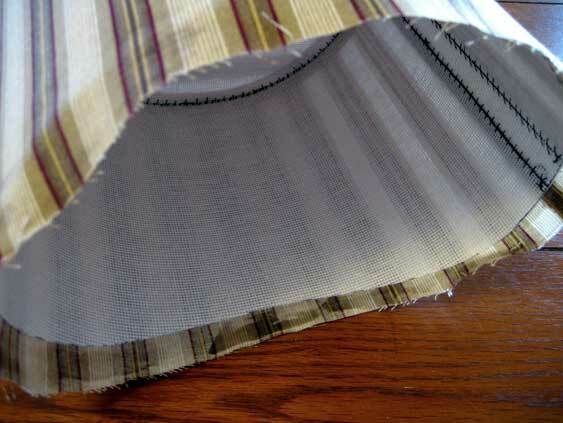 There are two pleats, one on each side, to allow for a little extra fabric in the lining. Slip stitching the lining just inside the edge of the hat. I don't want it showing from the outside. The lining all sewn in place. Now for the inner head band. I don't have millinery grosgrain, so it isn't quite as flexible as it should be, but it'll do. I've measured the length I need, and am connecting the ends here. 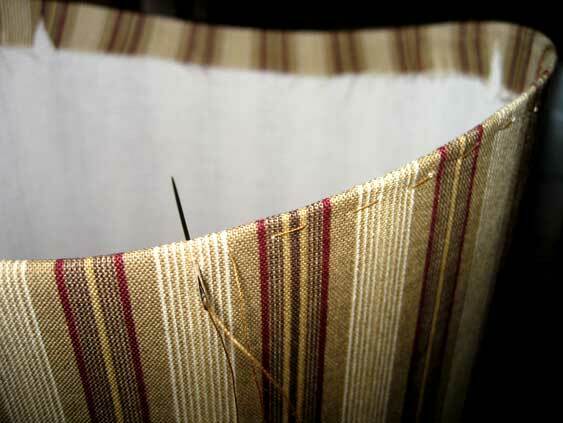 All connected, with the hem sewn open. 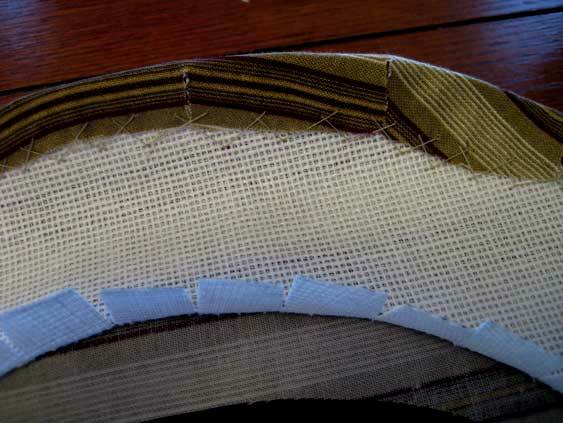 Sewing the head band in place just above the lining, but still inside the hat. Finished! This is the finished interior of the hat. I couldn't have done it without this book. We need more of the project diary/walkthrough type threads in Anatomical, they're so informative. 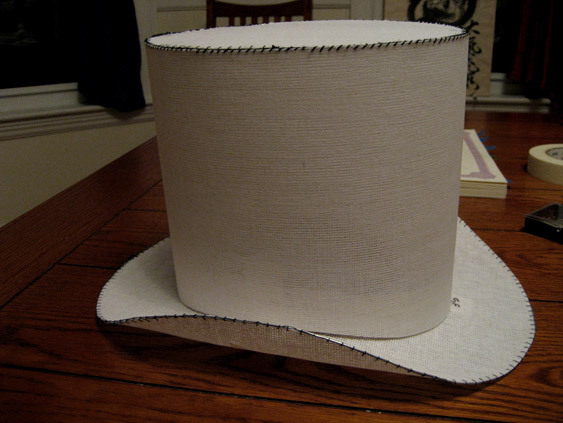 Thank you for such a well documented look at how to make a top hat! I also think that this needs to be stickied, so it doesn't get lost in the shuffle.